Sleek and modern, the Renaissance Indianapolis North Hotel is the perfect place to stay when visiting Carmel, Indiana, and the Indianapolis area. This relaxing hotel is located near Coxhall Gardens in Ritz Charles, The Palladium, Indianapolis Motor Speedway and Peace Water Winery. Because of the easy access to these locations, you’ll definitely want to stay at the Renaissance Indianapolis North Hotel if you are visiting any of these attractions. Once you get up in the morning and are ready to get your day started, you can grab some delicious breakfast and Starbucks coffee. For lunch and dinner, there is Grille 39, as well as room service. For some extra relaxation, feel free to take a swim in the indoor pool. If you like to work out, you can take advantage of the fitness center. 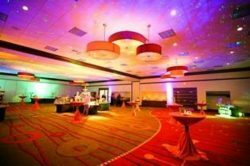 Make sure to book your stay at the Renaissance Indianapolis North Hotel when you are visiting Carmel or Indianapolis. Booking Howl2GO Dueling Pianos’ world class show to your Carmel, IN event couldn’t be simpler. From conventions to corporate events, weddings to fundraisers, our unbeatable Dueling Piano shows bring a high energy, interactive show that your guests will remember for years to come anywhere in Indiana!